Image caption First Minister Mark Drakeford: "The damage is here, the damage is now"
The Welsh Government's advice service for businesses has a more positive outlook on Brexit than ministers have, opposition parties said. Advice and support service Business Wales described 2019 as a "year of opportunity" in an advertisement. The Conservatives accused Welsh ministers of "speaking with forked tongues". A Welsh Government spokesperson said it has been "working tirelessly to secure a successful Brexit". Business Wales' advertisement says "Brexit 2019. A year of change but also a year of opportunity. An opportunity to look to the future with fresh thinking. "And an opportunity to work differently, better, together." Conservative AM Darren Millar responded: "The Welsh Government have been all over the place on Brexit and this statement makes it clear that ministers are still speaking with forked tongues. "On the one hand we hear Labour Ministers in the Senedd lamenting Brexit and suggesting that it is nothing but bad news, while on the other hand they are actively seeking to promote the opportunities that Brexit presents to businesses across the country. "Wales voted to leave the EU and all politicians, regardless of their political stripes, must get on and implement that decision." He called on Labour ministers to "stop grandstanding and playing politics by calling for another referendum, and instead they should focus their energy on delivering a successful Brexit." UKIP's assembly group leader Gareth Bennett said: "The film is trying to get businesses to engage with the Welsh Government over how best to prepare for Brexit. This is a sensible approach. "It isn't all doom and gloom, it does state that Brexit can provide opportunities for businesses. "I think it would be helpful if the Welsh Government ministers adopted this more practical and common sense tone when they debate Brexit in the chamber, instead of constantly repeating that 'we're all doomed'." A Welsh Government spokesperson said: "The UK government's own analysis predicts we will have a smaller economy under both the Prime Minister's deal and if we crash out of the EU. "Since the referendum, we have been working tirelessly to secure a successful Brexit that best promotes Welsh interests, and supports Welsh communities and businesses in their preparations for life outside of the EU. "Against a back drop of chaotic and confusing leadership from the UK government, we remain focussed on helping Welsh businesses to build the resilience they need to meet the challenges ahead and to thrive post-Brexit." 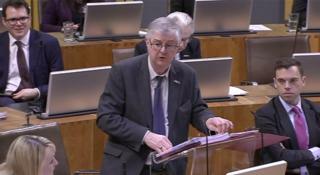 In First Minister's Questions last month, Mark Drakeford told AMs "we can no longer talk about the potential for Brexit to damage our economy - the damage is here, the damage is now, and every day of uncertainty further erodes the confidence of business investors, with the results passed on into the lives of working families here in Wales". "You only have to talk to organisations that represent smaller businesses to hear that the fear of closure is on every high street and on every industrial estate and in every part of Wales and the United Kingdom."